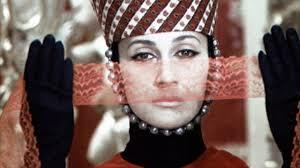 The Colour of Pomegranates is more series of living tableaux than conventional narrative cinema, like a surreal blend of theatre and painting. Watching this film is like strolling through a gallery resplendent with aesthetic styles and ethnic artefacts. The film is steeped in metaphor: pomegranate juice and blood appears throughout the film, bearing the weight of metaphoric meanings, from love to the martyrdom of the Armenian people. Mirroring Sayat-Nova’s lyric style, the poet whose life is charted in the film, Paradjanov heightens the sensory details of the scenes: the sound of hot, wet, newly dyed wool hitting metal salvers, the squishy sound of grapes bursting underneath toes. Significant moments are repeated and replayed as in memory and verse, sometimes with slight variations to account for shifts in feeling and perspective. We decided to score TCOP using instruments that to some extent represent the ethnography of the film. We open with the hammer dulcimer, an instrument popular throughout Central Asia and the Middle East, with a distinctive haunting quality, played by Robert Parkinson.Later a banjo echoes the Oud that can be heard in the original score. Cello melodies taken from Central Asia thread through the film, with Persian and North Indian percussion to complete the ensemble. Live Foley or special effects are used to capture the tactile, sensory nature of the tableaux. "You are Fire, Your Dress is Fire"